She’s also credited with being the first female movie star to wear eye makeup, with her look created by cosmetics tycoon Helena Rubenstein. 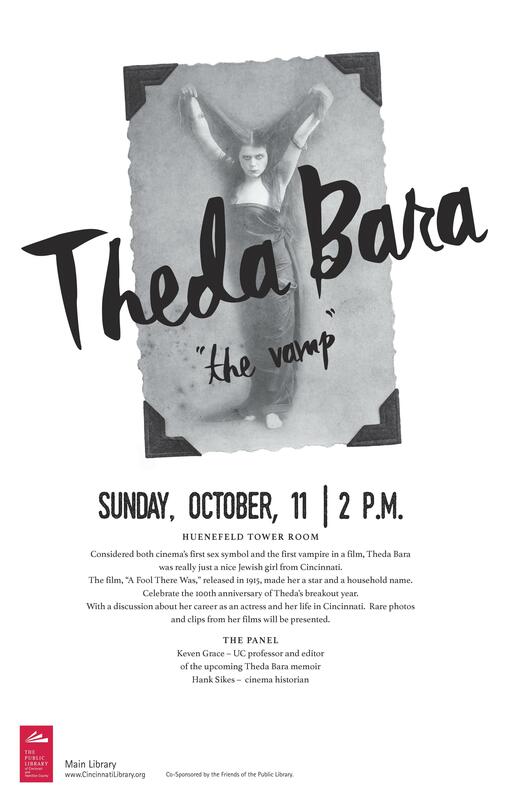 The “Theda Bara: The Vamp” program was organized by reference librarian and historian Brian Powers to celebrate the 100th anniversary of “A Fool There Was.” Her career will be discussed by UC professor Kevin Grace, who is editing Bara’s unpublished memoir; silent cinema historian Hank Sykes; and historian Dave Lewis. It begins 2 p.m. Sunday in the Huenefeld Tower Room at the Main Library, 800 Vine St.
She was born here in 1895 as Theodosia Burr de Coppet Goodman, named after Aaron Burr’s daughter Theodosia, according to a 1920 Enquirer story. She grew up in Avondale going to the silent movies after Walnut Hills High School classes. 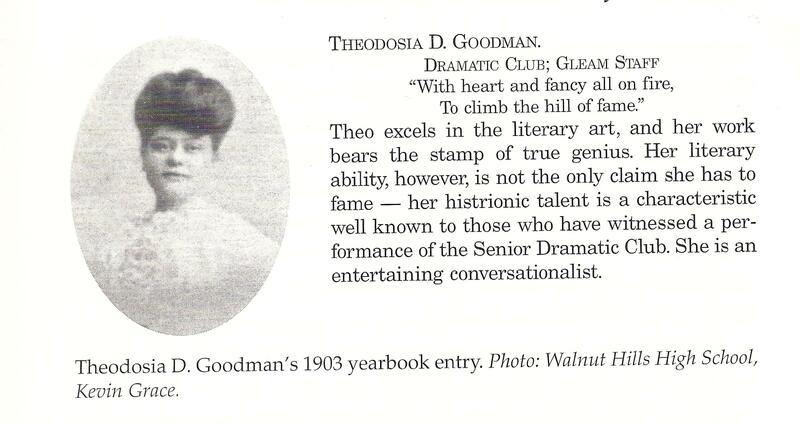 After graduating in 1903, she studied two years at the old Cincinnati College of Music before moving to New York. Her career ended before talking pictures premiered in 1927, according to an Enquirer story I wrote in 2011. Her last film was "Madame Mystery" (1926) with Oliver Hardy, directed by Stan Laurel. See all of her film credits here. In the 1920s, Bara built a white stucco Spanish villa at the corner of Ledgewood Drive and Victory Parkway. The building, adjacent to the Xavier University campus, was used as an honors students residence until it was demolished by Xavier in July 2011. 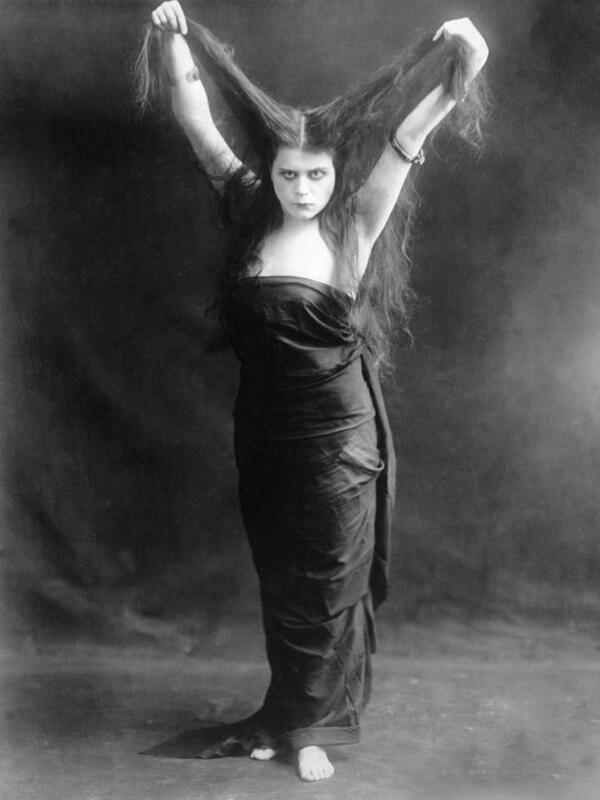 Theda Bara, the former Cincinnati girl, who has been creating a genuine sensation in the motion picture field, will be seen in two of her latest picturizations at the Alhambra Theater this week, Wednesday and Thursday, “Destiny’s archangel,” as she has been styled by some critics, will be seen in the Fox interpretation of “Carmen.” Many thrilling incidents and scenes mark this production, particularly noteworthy being the leap of horse and driver from an 80-foot cliff. Friday and Saturday Miss Bara will star in another production, “The Two Orphans.” This photoplay was said to cost the producers $200,000, and has been elaborately mounted. 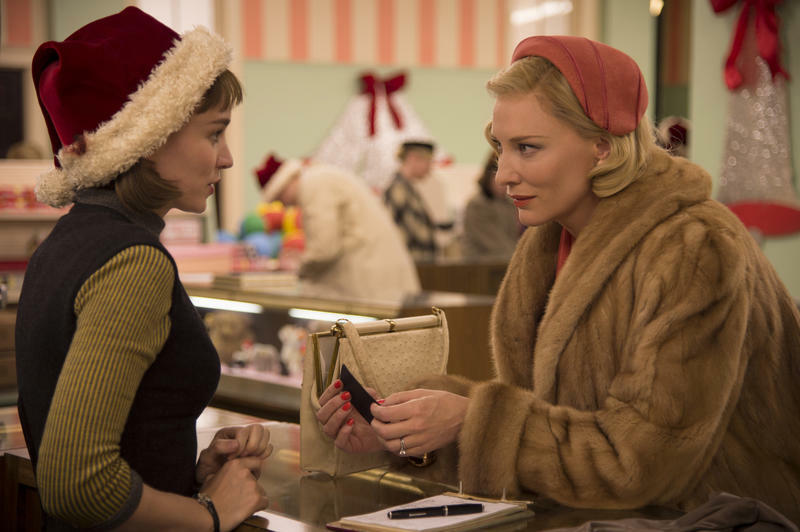 Rave reviews are greeting “Carol” in advance of its New York Film Festival screening Friday. Flavorwire calls it “flawless” and “gorgeous,” with “astonishing” performances. The Village Voice gushes about Todd Haynes’ direction. Haynes' work “has never been more assured, defined by silken camera work and expert framing that conveys his characters’ loneliness. … ‘Carol’ offers a mature portrait of love struggling to materialize, and survive, in a disapproving society,” the Voice says. Cate Blanchett’s “Carol” and Don Cheadle’s “Miles Ahead” filmed here last summer will have special Cincinnati screenings. “They will premiere here,” says Kristen Erwin Schlotman, executive director of the Greater Cincinnati & Northern Kentucky Film Commission. Details have not been finalized. “I have no dates,” she says. “Carol” and “Miles Ahead” will be screened this week at the New York Film Festival.